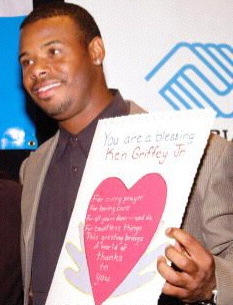 Anyone who followed Ken Griffey Jr.’s storybook career, first with the Seattle Mariners, then with the Cincinnati Reds and Chicago White Sox, before returning to end his career with in the city where it all started Seattle – knows that he has always been a big supporter of charities for young people. When he was asked to pose for the cover of Sports Illustrated For Kids the very next year, he invited an eight-year-old girl from the club to co-star with him. As sponsor of the holiday dinner for 350 children and teenagers, Griffey donated $10,000 to help provide food and music, balloons and gifts. But the most important thing he provided was a glimpse of their hero, and the belief that a wish can come true.